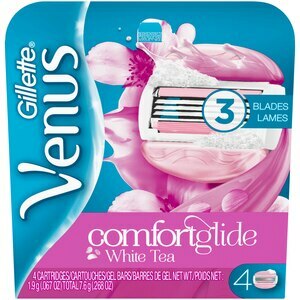 Wrap your skin in Comfort with Venus ComfortGlide White Tea razors. With 3 curve-hugging blades and built-in Soap Bars that release lush body butters with a White Tea Scent for an incredible glide, comfort and shaving experience. Ingredients: PEG-115M, PEG-7M, PEG-100, BHT, Tocopheryl Acetate, Aloe Barbadensis, Vitis Vinifera, Persea Gratissima. Easy to change blade refills. Change blades when shave gel bars wear down or blades feel dull. For best results, hang razor on shower hook to dry between uses.